On Sunday 13th August 2017 over 150 people took part in the Jersey Round Island Challenge. 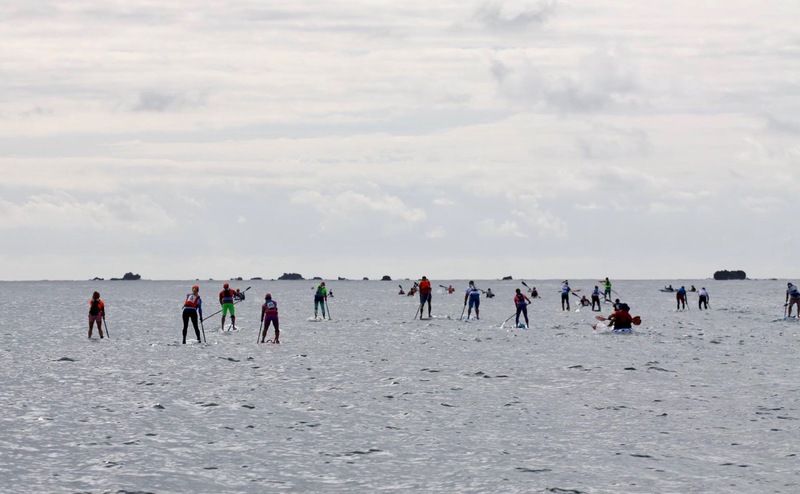 An exciting endurance event for stand up paddleboarders, rowers, kayakers, runners and swimmers, all with one goal… to circumnavigate the Island of Jersey. 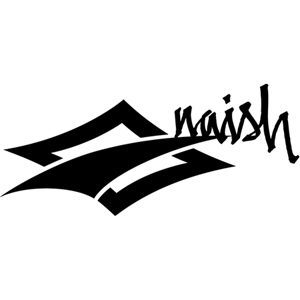 Participants can either take on the challenge as part of a team with designated change over locations, or go solo. 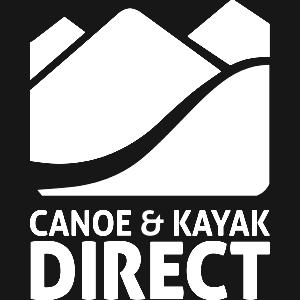 For SUPers this means approx 40 miles of non stop paddling in challenging tidal open sea conditions. 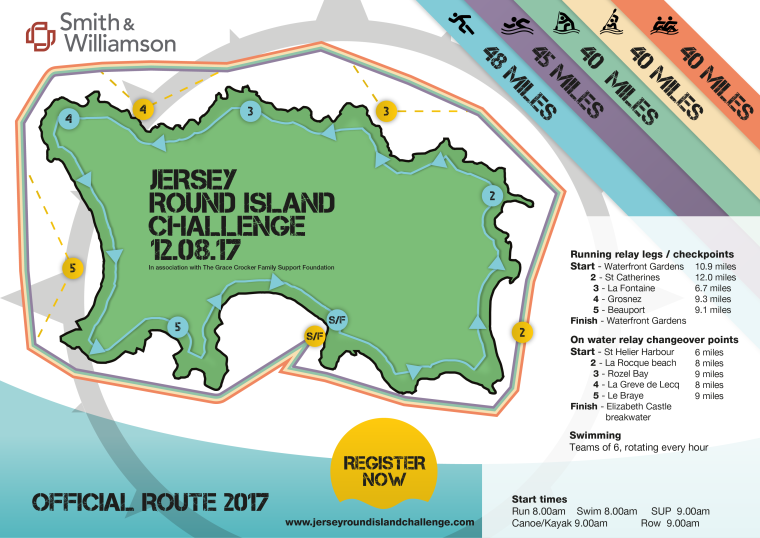 Just completing the challenge is a huge achievement, and the reason why the Jersey Round Island Challenge was listed as one of the top 11 extreme UK fitness challenges in 2016 by Red Bull UK. But for some, just successfully circumnavigating Jersey is not enough of a challenge, and it’s about completing it in the fastest time possible! With a very late call to enter (based on a marginal forecast), Ben Pye, Marie Buchanan and I travelled overnight on the preceding Thursday to catch the early Friday ferry to Jersey as foot passengers. Ben was part of a relay team, while Marie and I were taking on the solo challenge. 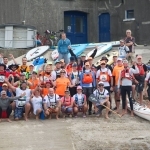 At Friday’s briefing, event organisers made an excellent call to move all waterborne events to Sunday, with the wind forecast to be significantly less than Saturday’s 20+ knots, which would have been a horrendous slog for most of the route and probably rendering full circumnavigation unachievable for most paddlers. A few of us took advantage of this wind for a downwind run on Saturday morning, far easier than battling upwind and side winds in those conditions! The challenge on Sunday began in St Helier with warm sunshine, light wind and a relatively calm sea-state on the south of the island. Aaron Rowe powered away into the lead at a blistering pace given the thirty-five or so miles that lay ahead. I missed the start by a few seconds rinsing off my hydration pack after accidentally urinating over it before the start! While I pursued Aaron, conscious not to push too hard early on, André Le Geyt was flying up the inside and clearly edging ahead so I diverted back inside and tailed him all the way up to La Roche. On rounding the corner and turning north, Andre’s path took him out wider away from the island in search of stronger flow. Meanwhile Aaron was forging ahead yet further out in fast moving water. With no time to waste I had to choose whether to stay in on the inside line (the shortest distance to the next corner, St Catherine’s breakwater a few miles north, or head out in search of faster flow. 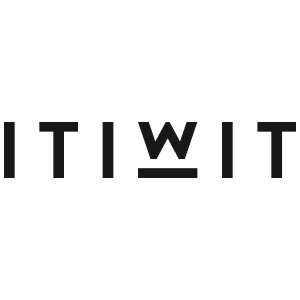 While my first thought was to follow the example of the locals, I also had been thinking pre-event to not simply be a sheep but be alert and look for opportunities. I spotted on the inside dark water where the current looked fairly fast. I figured that even if it wasn’t as fast as the water where Aaron was, it was still moving quickly and a much straighter line to the unmissable mile-long breakwater, where we needed to hook north-west to start the crossing of the north side of the island. My strategy paid instant dividends as I overhauled Andre, who was paddling a couple of hundred metres outside of the line I was taking. On reaching the breakwater Aaron had cut across and was heading much closer to the land. On this north-east corner of Jersey I had closed the gap to less than 50m and built a lead over Andre, whose flatwater board no longer seemed to be offering an advantage. As we approached a rocky headland I decided that staying on the inside line all the way along the north coast would not be the fastest due to reduced flow and chop bouncing off the rocky coastline. I angled my board out to sea and pressed on towards the faster flowing water around 1.5km offshore. At first this seemed a critical error as Aaron surged ahead hugging the coastline. 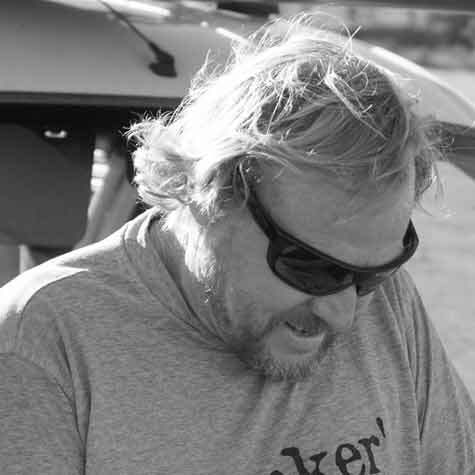 While I was doubting by decision, it was too late to change and I continued my journey further offshore in search of faster flow. Within minutes I spotted lines of seaweed and jellyfish indicating the current flowing north-west. Sticking to the “jellyfish highway” I steadily gained on young Aaron and while he became barely visible with me being so much further offshore, the support boat trailing him was enough to tell me I’d overhauled his lead. 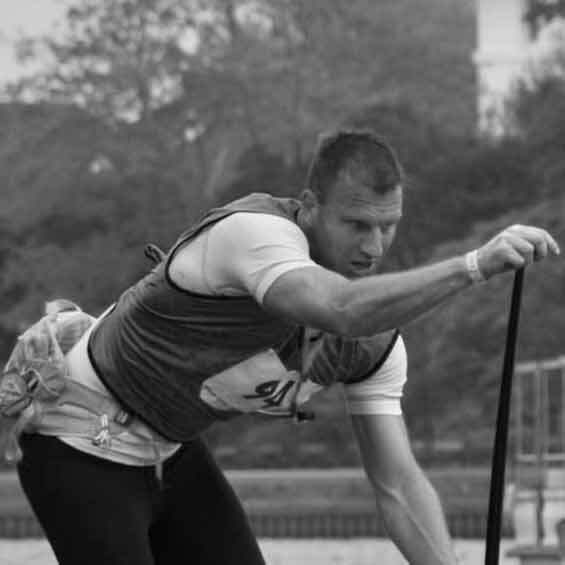 Starboard top racer Paul Simmons putting the hammer down. 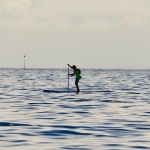 With good tidal assistance, my steady pace upwind to the NW corner of Jersey continued, with chop not large enough to unsettle my board or slow my progress. This was to change dramatically with currents and chop converging off Grosnez Point on the NW tip of the island. In conditions similar to some of our local headlands in South Devon, the sea state became confused and progress was slow around the point, with bumps seemingly moving in all directions other than desired! The toughest water-state of the journey unfortunately coincided with a significant plunge in my physical state: the body was starting to tell me that it wasn’t used to paddling this far, with legs beginning to cramp and arms aching. It wasn’t a spot to linger as standing was tricky so I quickly gulped a gel, washed it down with a few big gulps of water and smashed on through the lumpy sea. My only fall of the trip occurred here, thrown off sideways by a lump that had bounced off the cliffs that I hadn’t seen coming. The dunking turned out to be quite a relief, cooling the body off nicely and reminding me to focus on the water around me to ride over and through the turbulent currents. Expecting some downwind fun across St Ouens Bay I was soon disappointed with barely any ridable lumps and only slight assistance from the tide. Looking back I couldn’t see any rivals and I was clearly leading. Repeatedly checking over my shoulder I couldn’t understand why neither Aaron nor André had appeared. 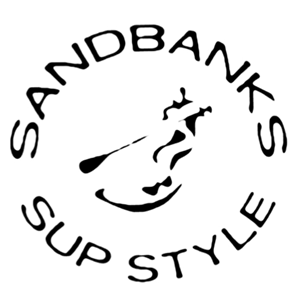 It transpired that Aaron had unfortunately been forced to withdraw with a shoulder injury and André’s flatwater board wasn’t best suited to the rough water, causing multiple dunkings and setting him back somewhat. As I pressed on, La Corbière lighthouse to the south seemed to take forever to reach but at least the smooth water state was easy on the tiring legs. It was even more demoralising on rounding the lighthouse and hitting the south coast, to find the current was flowing against me. Having passed this way on our ferry journey into Jersey and paddled most of it on a downwinder the previous day, I had a good idea of how far remained. While the ocean wasn’t offering much assistance, I was calm and composed slogging through the last few miles. Considering I hadn’t trained over any real distance at all in the run-up to the Jersey Round Island Challenge, I was pleased that my body was holding up: no blisters and only the occasional slight cramp in my right leg. 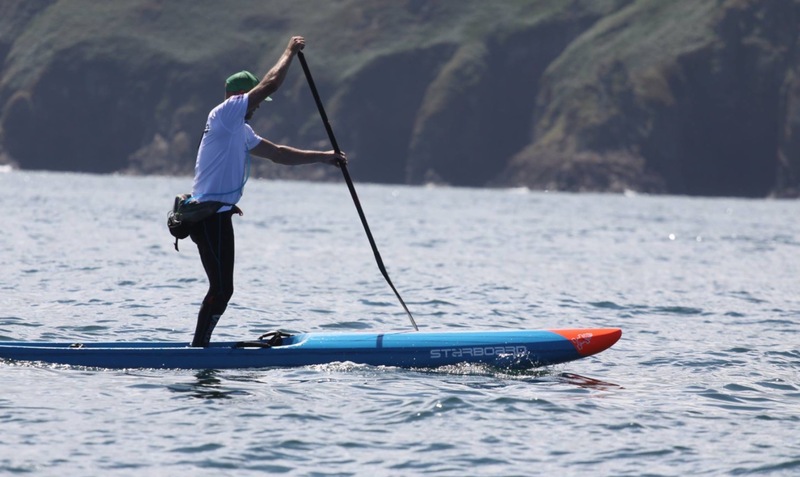 As I approached St Helier there were no other SUP racers in sight behind me; I was happy to be leading, ahead of some strong paddlers. Entering the bay the tide was racing out and after starting to cross the fast-flowing water I’m pleased I still had the mind focused on strategy as I cut back in and hugged the rocks to avoid the worst of the current. Jersey ripper Arron Rowe out in open water. In the final half-mile, a yellow sea kayak that I’d been close to for a long time caught my eye around 100m further out to sea. 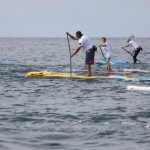 I could see the paddler working hard and I decided to race him for the line (despite him being in a different category). 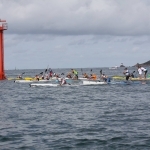 I was unsure if the start line (between the pier and a channel marker pole) was also the finish line, or whether we needed to finish on the other side between the finish boat and the pole. I headed out to cover both options but when I saw the kayaker heading inside the pole I straightened my course and sprinted for the line. I believe I pipped him but the official timing gave us both at 5:56:17. I’m happy to settle for the draw with him, being fastest SUP was sweet enough! 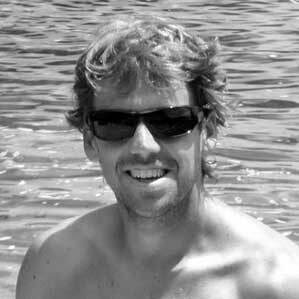 Meanwhile there had been a superb battle for second place between local paddlers André Le Geyt and Alan Fernandes. It was quite fitting that they were adjudged to be in a dead-heat too, with a very strong Marie Buchanan close behind. While some of us were competing and racing around the island, it really is a challenge that simply completing is a great achievement. All paddlers, OC, kayak, SUP and indeed the swimmers (who battled their way around for 10-11 hours) really earned the medals they were awarded for completing the challenge. 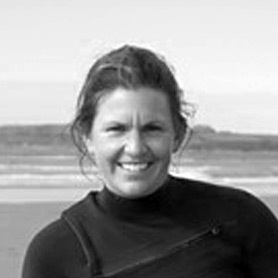 The event is in aid of the Grace Crocker Family Support Foundation, a fantastic charity helping families on Jersey who have to spend time away from home or the workplace while their child receives medical treatment overseas. 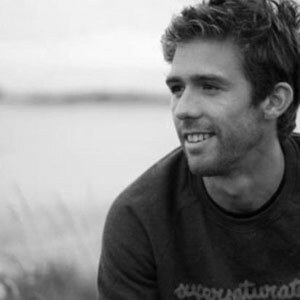 Jono Steventon – Jono’s Watersports (St Brelade) for accommodation, advice about the paddle and quality karaoke on Friday night! Plus (not-so-local) the holidaying John & B from Suffolk SUP for providing lifts, great company and a bonus fun surf on recovery day. Not forgetting Ben Pye for being great company for the whole trip! 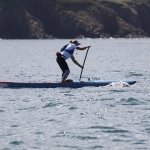 Scheduled for the start of September 2018, paddlers looking for something a little more than the usual SUP race should seriously consider next year’s Jersey Round Island Challenge; Paul and Marie will be back for sure!